Students use a mathematics teaching robot Ovobot during their lesson at the school in Tampere, Finland. The WEFFI report, by the Economist Intelligence Unit, looks at policy initiatives, teaching methodologies and the socio-economic environment of 50 countries. It found the five worst-ranked countries to be Egypt, Nigeria, Algeria, Iran and Pakistan. We live in an era that is increasingly being defined by change – in terms of both its speed and its spread. A number of start-up businesses, harnessing the power of technology, have successfully up-ended the status quo of sector after sector. There’s Amazon, which disrupted the sale of books and became the world’s biggest bookseller, before disrupting the book itself with the creation of mass-market e-readers and electronic book consumption. More recently, Uber has managed to redefine the taxi sector, and in the financial world fintech companies have changed the way people manage their money. But the next wave of change will have more profound effects, which is why it is so important for national governments to set in train the right policies. 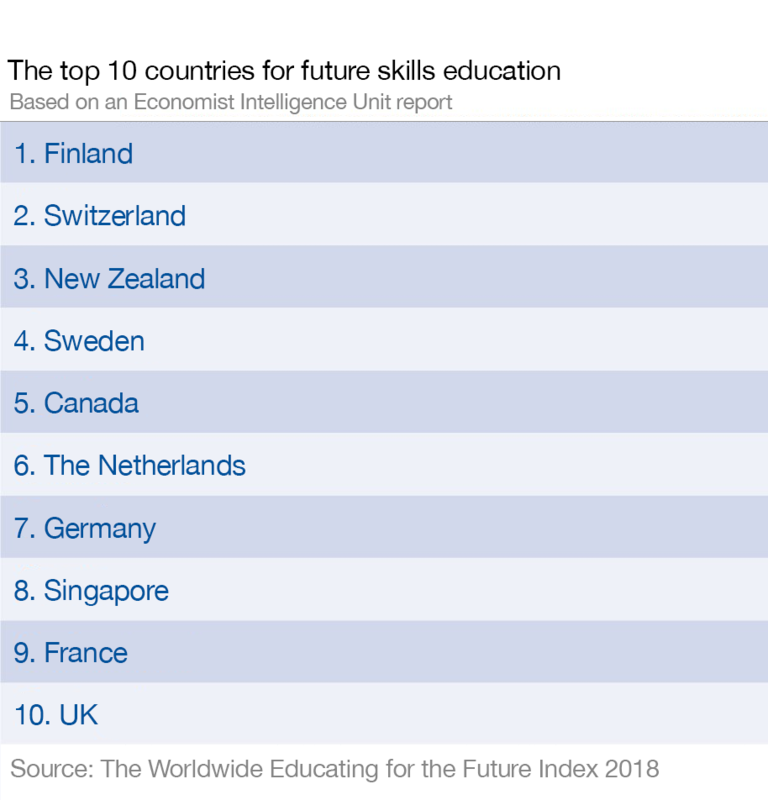 As things stand, according to the WEFFI report’s authors, most countries’ educational systems are not configured to equip the next generation with the skills they are most likely to need. Part of the challenge facing educationalists is that technological change will call for skills that fall outside of age-old approaches to curriculum design and teaching. Emotional intelligence, creative thinking, and collaboration are just three core aptitudes that will be needed, but which cannot easily be taught in a traditional classroom environment. This fast pace of technological transformation - often referred to as the Fourth Industrial Revolution - is based on a suite of technological developments that includes automation, artificial intelligence, the internet of things, the fusion of genetic science with biotech, and always-on access to data. The report highlights the importance of language learning and the role of AI as a teaching aid in the classroom. But it also points out that many key elements of future skills learning will take place outside the classroom. In the United States and United Kingdom, after-school clubs for primary and secondary school students are connected to evidence of better school attendance and better academic results. The benefits are being seen in high-poverty areas with low-performing schools, in particular. While so many aspects of life have changed almost beyond recognition, classrooms have altered little in 200 years. A group of students sit at desks facing the front, where a teacher stands, ready to impart facts; the challenge for teachers will also be to keep up with the pace of change.